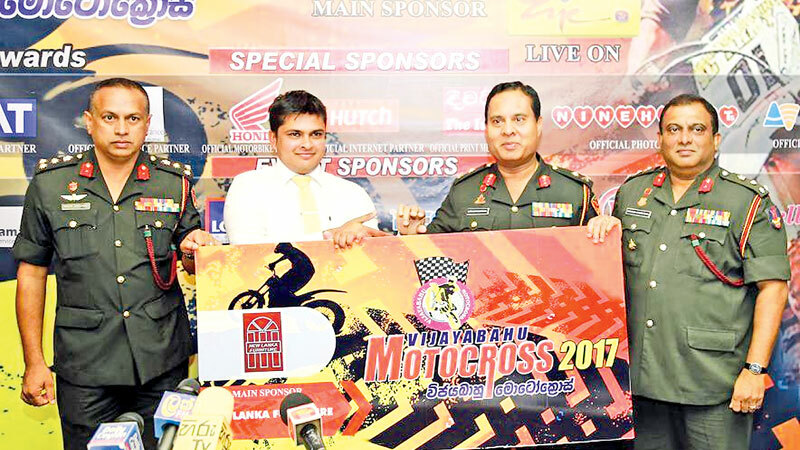 The Vijayabahu Motocross - 2017, organized by Vijayabahu Infantry Regiment for the 15th consecutive year in collaboration with Sri Lanka Racing Riders Association will be held at Vijayabahu Motocross circuit at Boyagane, Kurunegala on April 2.
the Sri Lanka Army, those of Wayamba province and islandwide with a view to popularize the sport and creating avenues for riders to show their prowess. It will also generate funds to provide welfare facilities for the families of the Vijayabahu Infantry Regiment officers and other ranks killed and missing in action.Two Japanese riders and over 80 Sri Lankan riders will take part in this year’s event. Last year’s Vijayabahu Motocross was a tremendous success with riders of the calibre of Shehan C. Adikari, Ishan Dissanayake,Ivon B. Gurusinghe, Sameera Premaratne, Nihal Wijeratne, Jacques Gunawardeneand International riders stealing the limelight. Funds raised by previous motorcross event were utilized for ventures such as construction of houses for the members of the Vijayabahu Infantry Regiment, providing infrastructure facilities for officers and other ranks, awarding scholarship and donation of computers for the children of the members of Vijayabahu Infantry Regiment to excel in their studies. New Lanka Furniture is the main sponsor for the event while Sri Lanka Insurance, Elephant House, Hutch, Honda, CEAT Kelani Tyres, NineHearts, SL Rupavahini are the other sponsors.